Study: Trump’s Endorsement Did Absolutely Nothing for Luther StrangeIn case you were wondering, some post-runoff polling from Alabama confirms that support for Luther Strange stayed flat after Trump backed him. Trump Congratulates Moore, Deletes Tweets Backing Alabama Senate Primary LoserThe defeat of Luther Strange shows Establishment candidates may be in trouble, even if they can secure the president’s endorsement. 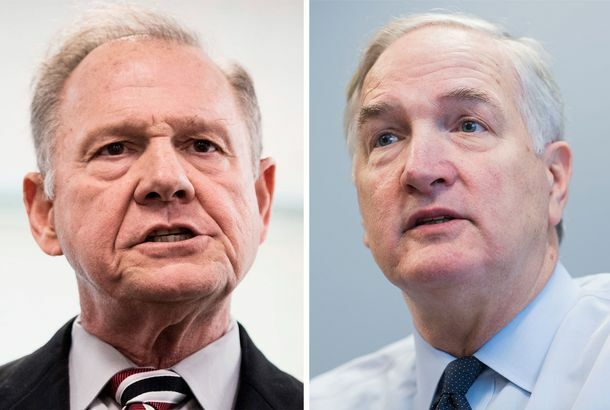 Roy Moore Beats Trump’s Candidate in Alabama Senate RunoffDespite presidential and vice-presidential campaigning and massive infusions of money, appointed senator Luther Strange lost handily. The GOP’s Latest Attempt to Repeal Obamacare Won’t Even Get a VoteAfter a pretty depressing luncheon discussion, Senate Republicans decided they won’t humiliate themselves with a vote on the Graham-Cassidy bill. Trump Gives Luther Strange a Boost — But Keeps the Focus on HimselfIn a typical Trump rhetorical effort, the president rambled through many boasts and gripes and whines, but probably did just enough for his candidate. The Alabama GOP’s Senate Primary Lives on the Theocratic FringeRoy Moore’s wild theocratic views would make him a joke in most places. In Alabama, his desperate GOP foes won’t even mention them.